Standing Rock: The Most Important Struggle of Our Age? It’s not the flow of oil that’s at stake at Standing Rock, it’s the flow of money. I was thinking about why there’s not been a massive shift of investment to renewable energy: wind, solar, wave, when it’s been pretty clearly established that renewables could replace virtually everything we get from oil but lubrication and plastics, both of which also have alternatives; and watching the battle over the pipeline, it occurred to me that the answer is right there in front of our eyes: oil flows. As oil moves from source to refinery and production, to all the points of distribution, capital follows, multiplying at every stage. Renewables are far more than alternative sources of energy; they represent, forgive the cliché—a paradigm shift for economics, and existing structures of power. In this light, what an amazing confluence of interests and circumstances is happening now in North Dakota! The emergence of native peoples, the blocking of the pipeline, which is the blocking of the flow… the Flow, the power driving the one civilization blocked by this beautiful eruption of spiritual power from another, one that is both a reassertion of what existed before European dominance of the continent, and promising yet another, a new world that is indeed, possible! 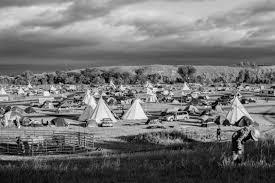 This confrontation in North Dakota has become, materially, symbolically, spiritually—the focal center of the most important struggle of our age—on the outcome of which hangs nothing less than the survival of our species… and the many others we will take down with us if we fail. Posted on December 1, 2016 December 3, 2016 by wjacobrPosted in Goby's Journal, PoliticalTagged activism, Art & Capitalism, Politics. Exactly, and when that circulation itself is thwarted… when localization fragments the economy, the political system has to change with it. Why there is so much resistance to what the Protectors are doing at Standing Rock, where we’re seeing other forms of localizing as well, such as health care, where forms of organization are emerging, radically different than anything you find in standard practice, incorporating the non-hierarchical consensual models of Street Medics– herbalists, professionally trained physicians, nurses, EMT’s, working beside and with volunteers and traditional healers.